Rourkela: In yet another blot on ‘khaki’ Vigilance officials in Sundergarh district today arrested an Assistant Sub Inspector (ASI) here for falsely implicating a person in scrap theft case and taking bribe to release him later. The accused ASI has been identified as Madhusudan Patra, ASI, Brahmani Tarang Police Station. As per the allegation against the accused ASI, he had nabbed one Laluram of Udit Nagar area over personal grudge and detained him at Brahmani Tarang Police limits for past two days after falsely implicating in a scrap theft case. While the ASI was demanding a bribe from the victim’s family for his release, he arrived at his home last night and forcibly took away his younger brother to police station. He also threatened the family to implicate their second son in the same case if they fail to fulfil their demand. Later, the matter was settled as the family assured the accused cop to pay a bribe of Rs 5000. 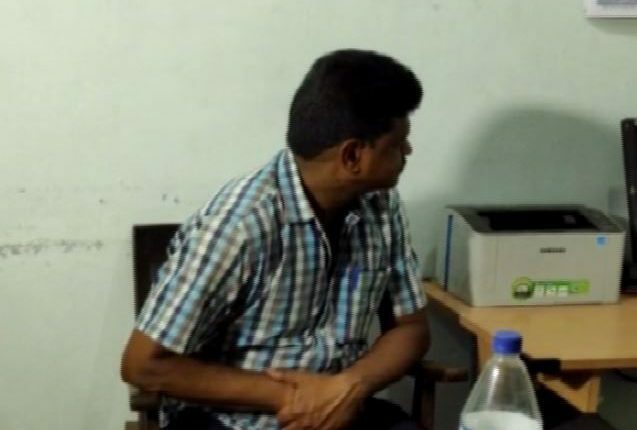 However, the anti-corruption wing officials swung into action today after the victim family reported the matter to Rourkela Vigilance DSP and the latter led a trap to arrest Patra while accepting the bribe amount.